"Here's something I'd like you to think about before you respond; "What are the differences between a map of local stars that we make, and a map of local stars ET makes?" None, as I said before. You are the one who appears not to understand that analysing Betty's map is not the same as analysing the map she supposedly saw, as we do not know how close to the original her version is. You are comparing "evidence A" with "evidence B" and saying that "evidence C", that nobody has seen except Betty, is the same as "evidence B". And, you stated above that ET's maps are the same as our maps. So what's the issue here? You claim you understand that our star maps are identical to ET's maps of the same stars, yet you fail to understand that we don't actually need ET's version since we can recreate it with great accuracy. So; yes...I'm comparing evidence A with evidence B, knowing that evidence C is identical to evidence B. And, because of that I can accurately, and, scientifically state that the quality of match (accuracy) of Betty's drawing is...shall we say 90.8%...the average of the Blob Analytics (82.5%) and the Computer A.I. (99.1%). I know that, as I said before. No doubt this is true, BUT even if it was the ET map, is there any significance to it at all? Does it have a good match that is unique? Or are there multiple solutions for the map that make it of no significance, no matter the source? If there is only 1 solid match for it, you dont find that significant? 1.The point of view is about 200 ly from Earth...about 150ly past Zeta Reticuli and in that general direction. 2. I selected only "F", "G", and "K" class stars...so, if we don't consider other factors like variability, binary star, etc. all are theoretically capable of sustaining advanced life. 3. The map is what we would expect from an explorative sense, closest stars of interest(life) first. The assumptions may or may not be good, if would be good to see what stars are being skipped. I wish I had more time to devote to this, unlike the Ramey note in Roswell, I think this can be proven one way or another. Yes, it does have a good match; according to Computer Vision Template Matching software, the match is 99.1% A manual, "Blob Analysis" returns 82.5%. And, Yes, it is a very unique match. Mathematically; the probability of even one match, is 1.0e-94, a second match would be 1.0e-188. These probabilities are, for any practical purpose, impossible. The stars skipped; Mainly Class "M" stars, however these are mainly small rather cold (for a star) stars with very close in habitable zones. Typically planets in the habitable zone are tidally locked, so they have a hot side and a cold side, and no "warm" mix. Although some of those planets could support Human life. Other stars are Class "A", class "B", and class "O" stars; these are increasingly hot stars, and typically burn out quickly, and thus don't afford any life that might form on its planets much time for evolution. It is the warmer class "K" to cooler class "F" stars that provide the best environment for life as we know it. I really like your map above, it would be extremely helpful if you removed all the really distant stars(noise). I think people are led to believe that you are arbitrarily connecting dots when many of the dots on the map are not close(relevant) at all. The most difficult part of this discussion, as in the previous thread, is the drive by posting with people ignoring the hard data. Actually most of the "noise" created by more distant stars is already removed. The "maps" I'm currently building are a view of a sphere around our Sun extending out 150 light years, or 46 parsec. I originally used a 33 parsec model (107 light years), but at 107 ly I couldn't contain the POV, as it is at 122 ly, so I increased it to 46 parsec. 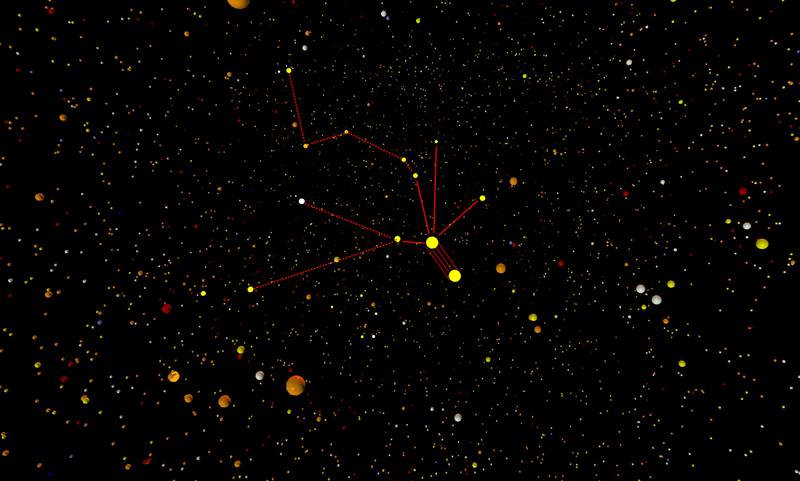 ETA: the 46 parsec view has 5804 stars, the 33 parsec view has 2826 stars. The issue is that we do not know which stars were shown on the ET map Betty saw. 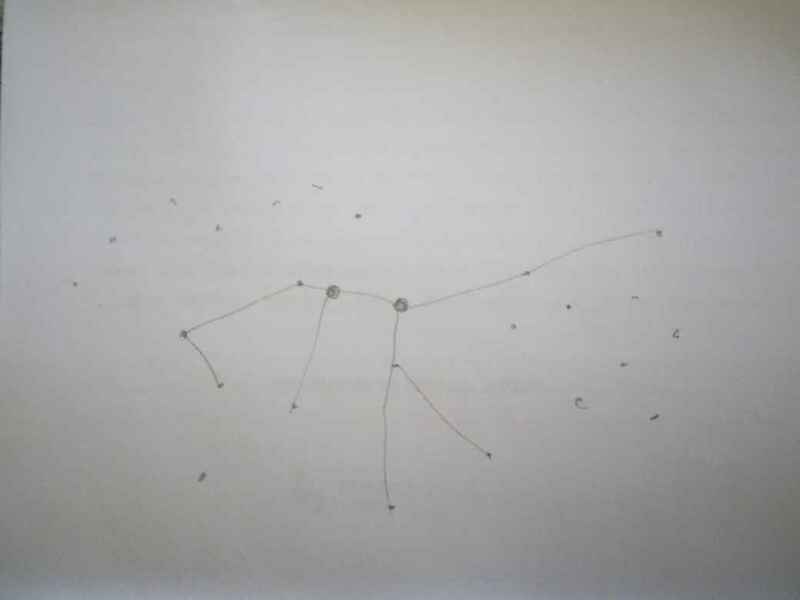 Yes, the stars are the same for us or for anyone else, but we cannot know what was shown to Betty. Imagine I have a map, and you know that the map shows an area of the United States. Then someone else looks at the map and draws a copy of my map. I will even ignore the possibility of that third person forgetting some details of the map, as I will make my hand-drawn version just after looking at my original map. Here's my hand-drawn version of the map. Now, we know that the relative positions of the cities are the same for you, for me and for anyone else. But you don't know the map's scale, if I used a standard method of representing things on a map or how accurate my hand-drawn map is. As you don't know that, you don't know if you are looking for that specific number of cities, for those relative positions, etc. As you do not have access to the original map you don't really know if whatever final result you reach is the same as in the original map, you can only find map similar to the hand-drawn map. PS: it would be interesting if you could find a match between the above map an reality. Yes ArMaP, we DO know which stars Betty was shown, we have gone to great lengths to identify them. Using accepted astrometric data, mathematics, we have determined not only the identity of all 25 stars, but, the Point of View as well. We did this by actually looking at the data. We built 3D scale models of the local stars and found the single location from which that specific configuration of stars can be seen. We then identified the stellar bodies we found. No, that result is from Betty's map, not from the original. "That configuration" being the one on Betty's map, the only one we have seen. As long as you do not understand that you are working with the wrong data you will always be fooling yourself.